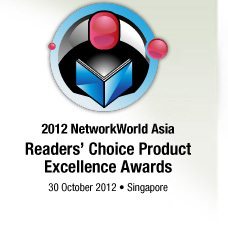 Welcome to the 2012 Network World Asia Readers’ Choice voting page. Choose the top 2 for each technology category which have made the most impact on your organization in 2012. If you don’t use the technology yet, give a vote to those technology vendors that you believe are leading the pack. And tell us of any new players which are doing good work with good technology, if any. At the end of the voting period, we will draw 10 winners at random to receive a US$50 Amazon voucher each. Winners will be notified through email at the end of November 2012. N.B. Votes from vendors will be excluded from the final count. Instead, vendors should encourage their customers to vote for them!